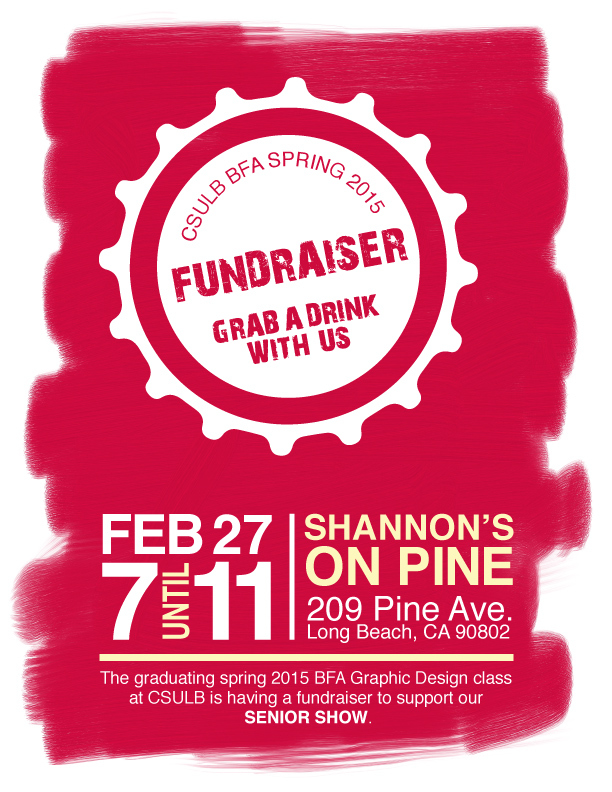 The graduating Spring 2015 BFA Graphic Design class at CSULB is hosting a fundraiser to garner support for their Senior Show this May, with proceeds going toward materials, printing and display equipment needed for the exhibition, a culmination of two years of challenging design work during the program. The fundraiser begins at 7:00PM this evening at Shannon’s on Pine. Attendees are asked to mention “CSULB Graphic Design” upon arrival to receive a wristband, then show it when purchasing drinks and food. Shannon’s will donate a portion of the sales to the show. This semester’s Senior Show will display work by students Kevin Augustin, Gustavo Alvarez, Christina Cedeno, Zepyor Toomanian, Jessica Nam, Jay Jay He, Pedro Hernandez, Bruce Reyes, Kiana Hovind, Van Duong, Michael Kubota, Carlos Ortega, Anastasiia Palamarchuk, James Truong, Omar Ibrahim, Eddie Chan, Phuong Dinh, Talia Touch, Seth Stephan and Nic Freeman. The Senior Show’s opening night will be the evening of May 17 at the School of Art Galleries on campus and will continue to be on display through May 21. This semester’s show is a step in house, compared to the classes of the past three years, who have chosen to show their work off campus at venues such as MADhaus Gallery in downtown Long Beach. And while MADhaus is a choice exhibition space, with its exposed brick interior and open concept, this year’s graduating class wants to showcase just how great the University is. Work will be displayed from past classes taken throughout the two-year program along with new projects developed specifically for the show. The students’ most recently submitted designs to ONE SHOW, a design competition in New York, focusing on the concept of kids and technology and whether “exposure to the digital world at such a young age” is a good or bad thing. This work will also be on display at the Senior Show. For more information, check out the Facebook Invitation here and use the hashtag #ShannonsOnPine if you care to Instagram your experience while in attendance. For more information about the entire Graphic Design program, click here. Shannon’s on Pine is located at 209 Pine Ave.